Every now and then, I like to indulge in a take-out meal. Some days, the fridge is empty, or you don't have the time or the motivation to cook, and so reaching for the delivery menu is a guilty pleasure, even for a culinary school graduate! One of my favorite indulgences is Pad Thai, that perennial workhouse of take-out Thai places: I've always felt that it was a bit of a shame that this light, tangy, dry noodle dish was only mostly enjoyed from a carton with disposable chopsticks. So, tonight I pulled out the massive Hot, Sour, Salty Sweet cookbook that has sat untouched on my coffee table for far too long, and adapted this recipe, which worked quite well. It was quick to make, full of flavor and less greasy that most ordered-in versions. Prepare all of the ingredients before you start cooking, as the stir fry process goes quite quickly. Soak the noodles in warm water for 20-25 minutes prior to cooking. Cut the chicken breasts into bite-sized pieces and mix in a bowl with the sugar. In a separate bowl, mix together the fish sauce and soy sauce. Strain the tamarind mixture and add it to this bowl as well. In a third bowl, beat the three eggs lightly and reserve. Heat a wok on medium-high heat. Add 2 tablespoons of vegetable oil and the garlic. Stir fry for about a minute or just until the garlic browns. Add the chicken and allow it to sear for about 30-seconds, and stir fry for an additional 1-2 minutes to cook. Add the tofu cubes and sear them as well for 1-2 minutes. Pour over the egg mixture and allow it to set for 2-3 minutes. Carefully break up the egg with a wooden spoon. Remove the egg and chicken mixture from the wok and reserve. Rinse the wok and place back over high heat. Add the remaining one tablespoon of oil, and, when it is hot, add the drained noodles. Allow them to fry for about a minute. Add the tamarind and soy sauce mixture and stir. Add the bean sprouts and green onions and stir the mixture for another 30 seconds. Add back the chicken and tofu, cook for another couple minutes and serve with coriander, peanuts, and lime wedges. Enjoy! I've never made my own pad thai. Thanks for the inspiration. For as much as I love pad thai, I've never made it myself. I can't wait to check out this recipe! Your pad thai looks so delicious--even better than takeout! I know this sounds lame, but I love that you added the lime, so many people forget that and it really ties it all together. I always thought that Pad Thai and other similar dishes had a lot of nuts or nut oils in them, which made me stay away from them (allergy) but your recipe looks quite good and I'm sure leaving out the nuts wont affect this dish that much. I love making homemade pad thai..it's been awhile since I've done it. Yours looks healthy and delicious!! I don't usually think to put tamarind paste in my pad thai - that's a good call. Also, I just love the colors in this photo. I don't like tofu but this dish looks amazing! Pad Thai is one of those dishes that I can eat daily. Love the grilled Caesar salad and the pound cake that I missed. LOVE pad thai -- I bet yours is delicious! Beautiful photo too!! I'm so embarrassed to admit that I've never had pad thai. I should give this a try! This looks delicious. I just went to Thailand last week and learned to make Pad Thai with shrimp and tofu. I am SO anxious to try it out! Hopefully sometime next week... Thanks for sharing! This looks amazing!!! I love the photo! I tried that grilled lettuce.... it was delicious! I am on a CONSTANT search for a good pad thai recipe! Can't wait to try yours! 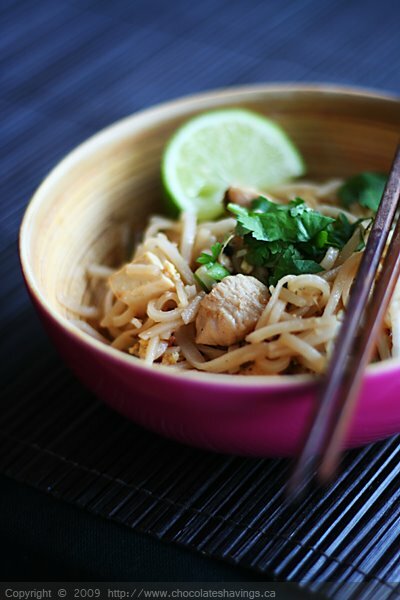 Wow this looks amazing, I've been wanting a good Pad Thai recipe since FOREVERr!!! I am so glad you posted a Pad Thai recipe! I've been wanting pad Thai for weeks :)! MorganF: Let me know what you think when you get to try it!